The Florida Keys archipelago is surrounded by the 2,900-square-nautical-mile Florida Keys National Marine Sanctuary. Designated as a protected area in 1990, it is home to some of the most endangered marine life on Earth and encompasses the third-largest barrier reef system in the world. More than 500 tropical fish species cruise the waters surrounding the Florida Keys. Brightly colored aquarium-type fish include wrasse, damselfish, parrotfish, goby, angelfish and butterfly fish. More ominous-looking fish include yellow or southern stingrays, nurse sharks, lemon sharks and spotted, green or goldentail morays. Anglers have the opportunity to land mahi, wahoo, skipjack, sailfish, tarpon, grouper, bonito, swordfish, blackfin tuna and king mackerel. A resident group of bottlenose dolphins calls the warm waters surrounding the Florida Keys home. For a more up-close and personal interaction, companies throughout the Keys offer the opportunity to interact with dolphins one-on-one in a controlled environment. West Indian manatees, also known as "sea cows," drift languidly along the coastlines and into warm, calm inlets throughout the Keys. 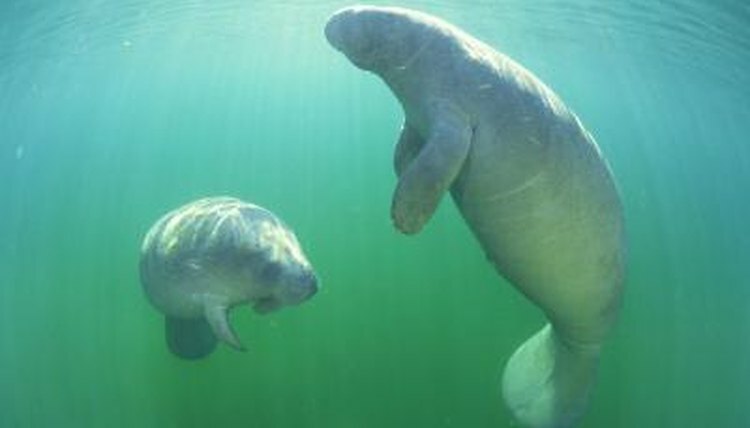 Endangered, primarily from unfortunate run-ins with boats, manatees are protected under the Marine Mammal Protection Act. These large herbivores, weighing as much as 1,000 pounds at maturity, eat 150 pounds of aquatic grasses each day. Approximately two-thirds of Florida's 358-mile coral reef system lies within the boundaries of the Florida Keys National Marine Sanctuary. Called the "rain forests of the ocean," coral reefs support 25 percent of all known marine life on Earth yet cover less than 1 percent of the oceans' floors. In the Florida Keys reef system you will find more than 45 species of stony corals, 37 species of octocorals and 70 species of marine sponges. Brain coral, star coral and the endangered elkhorn and staghorn corals are the most common reef builders. Octocorals include pale lavender or green sea fans, which resemble trees or shrubs, and long, feathery sea whips in hues of orange, lilac, purple, yellow, brown and buff. A total of seven species of turtles inhabit the Earth. Five of those species live in the waters surrounding the Florida Keys, all of them endangered. The leatherback, the largest, has a soft, leathery carapace and grows up to 2,000 pounds. Other turtles include the kemp's ridley, loggerhead, hawksbill and green turtle. While they spend most of their lives in the water, females go ashore each year to lay their eggs in sandy nests. The lionfish is a non-native, venomous fish, artificially introduced into the Atlantic Ocean. Readily identified by their red and white vertical stripes and long, menacing spines, the lionfish reproduces easily, grows quickly and can swallow prey up to twice his size. Due to a lack of predators and his ability to overwhelm a habitat, he poses a threat to the balance of the Florida Keys ecosystem. The Florida Keys National Marine Sanctuary has been asking divers to remove these fish whenever found.